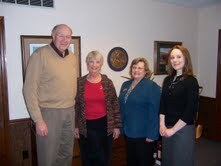 Elaine Steingrubey, director at Morrison-Talbott Public Library, and Erica Pyle, director at Columbia Public Library, and I traveled to the Sparta and Okawville offices of Representative Reitz and Senator Luechtefeld to talk with them about the value of libraries and their importance to the legislators’ constituents. We also shared with them the SNAPSHOT activities in their libraries and here at the System. Having those stats and comments made an impression on the legislators in a meaningful way. Both legislators gave us all the time we wanted and helped us to understand what will need to be done to improve Illinois’s economic climate and repair the damage done to the budget. I will be booking visits to other LCLS legislators and will be contacting directors to come along. It was a very enlightening experience for the three of us.